You must be a member of the Gothenburg Health and Fitness Group to attend this activity. Would you like to join this group? We are booked for 60min and is strictly informed that we have to be there for the instructions at 17:40. We will pay individually, so please come early. 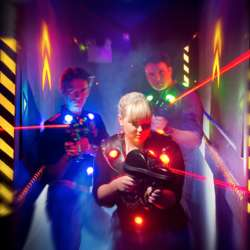 With sensor-provided vests on the body and futuristic laser guns in your hands, you chase each other through dark corridors, up ramps and over obstacles. Before the game everyone gets to see a movie explaining how the game goes. Once inside the armory, you put on the equipment with the gun forward, tighten the equipment firmly on both sides and check what name the vest has on the weapon. You are now ready for the match. When the referee activates the game, you have 20 seconds to hide in the arena. After 20 seconds your equipment is activated. Your task is to collect as much points as possible by shooting the flashing fields on the enemy equipment. Each player has 5 flashing fields (hit areas). A hit on breasts gives Protected content , back Protected content , shoulders & weapon hit 50 points. Each hit is automatically recorded in your equipment and you are awarded points. After the end of the game, the results are compiled and everyone can see the end result on screens in the weapons room and reception. I have done this once here in Gothenburg, it is so much fun! You will be so sweaty running and sneaking so bring an extra shirt and water bottle with you. - I am still using my Finnish number. But feel free to contact me through WhatsApp. -Should you change your mind on joining, kindly tick off your name as attendee. Thanks!